The quest started for me in 1998 but before then, even as a small child, I had always wanted to be an archaeologist when I grew up. This was at a time before there was an Indiana Jones to idolize and romanticize the world’s view of archaeology. I wanted to know and learn truth and even at a young age, I knew that one day archaeology would help solve the grand mystery of our existence on planet Earth. Of course, life can sometimes throw us curve balls and plans don’t always go as expected yet our ability to channel our drive and passion positively can sometimes lead us full circle. Although I did not become an accredited archaeologist, after years of study and a constant yearning for truth and knowledge I may finally be getting closer to my childhood dreams. The search for our ancient past, as many researchers and archaeologist will tell you is certainly not a glamorous endeavor and requires hours upon hours of research and observation. Perspective is key when trying to identify new archaeological sites and it wasn’t until the mid 90s that a new perspective became available to help make new discoveries, the view from above with the help of Earth orbiting satellites. It was around this time that I became fascinated with using satellite imagery to search for lost ruins at a fairly young age and I began searching old Landsat imagery in the late 90’s for clues left on the landscape that may have went unnoticed. I also used aerial imagery of the US that could be accessed with the program that NASA created for civilian use called World Wind. I would keep a log of my searches noting the GPS coordinates to visit at a later time or when better imagery would become available. As time progressed the tools improved and I began searching with the program Keyhole’s Earth Viewer that would later be acquired by Google and transformed into Google Earth. 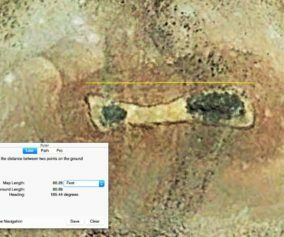 With the new sophistication in satellite imagery and the amazing resolution that began to improve over time, I began to notice and log sites all over the world that looked artificial, yet I could find no precedence or explanation for the sites in the archaeological journals and documentation. For many years I was driven by my dreams from childhood about lost cities that were so old that dust and decay from foliage and weathering had completely concealed them and hidden them within the landscape. These dreams had driven me to search satellite imagery hours on end year after year to find clues and remnants that perhaps these dreams may actually exist in reality. This was something I became obsessed with so much so that the majority of my early adult life was spent in my own private hermitage where I searched hours on end for the lost cities of my dreams. This new field of archaeology was classified as satellite archaeology by NASA scientists and I used the term to explain my hobby. From 2007-2009 I began an extensive satellite imagery search of Egypt to identify any sites that had gone unnoticed or were hidden within the landscape to the point of disguise. Few realize that searching satellite imagery is a very time-consuming process one that requires patience and motivation as it can take hours that turn into days to even begin to view an area as large as a US state at high resolution. This process is known as trying to find the proverbial needle in a haystack scenario that is considered to be similar to torture for those who have little patience to endure such a tedious task. 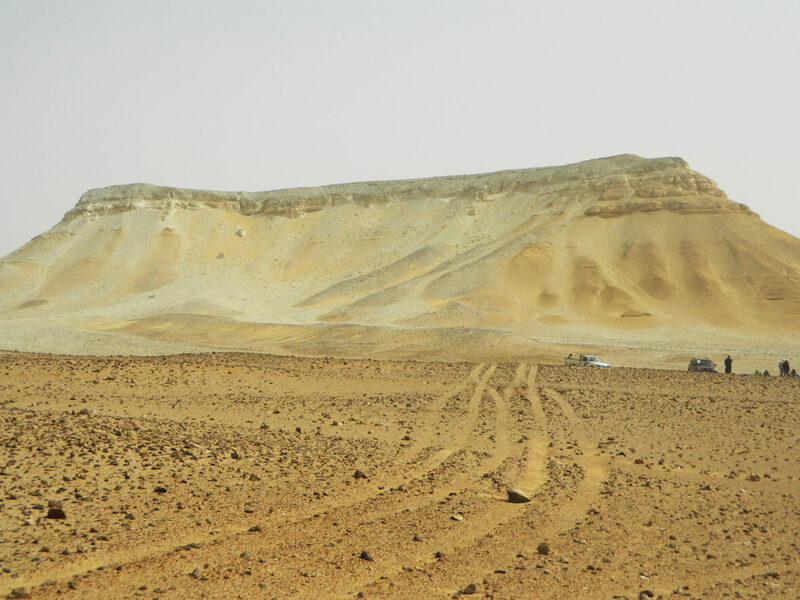 Narrowing the search is key yet when wanting to find areas of undiscovered features it is wise to search high and low as climatic changes may conceal riverbeds or areas that could yield signs of ancient habitation. Abu Sidhum site. 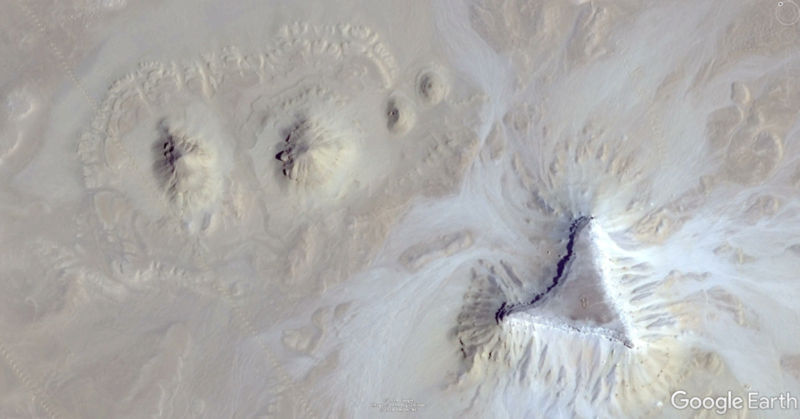 2 larger mounds and 2 smaller mounds flanked by a triangular butte that first caught my eye from 30,000 feet. When I found the first interesting site in Egypt my mother was in the hospital trying to recover from cancer treatments and I would go visit her every day and search the Egyptian desert while she was sleeping. 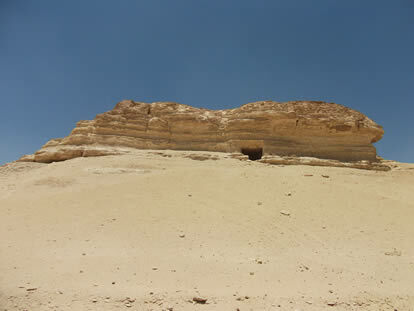 I was first drawn to the Abu Sidhum site by an initial scan of the area at an altitude of about 30,000 feet. I tend to start at these altitudes when searching for sites so I can cover a larger area more quickly than searching at altitudes of less than 10,000 feet. This process is something I have learned over time. The first thing that caught my eye was a triangular feature that was very unusual and I zoomed into the site for a closer inspection. This triangular feature appeared to be a natural butte, yet I was more than a bit fascinated that the feature has almost equilateral sides. Triangular butte feature from the ground perspective. I also noticed there were 2 larger mounds of a similar size and 2 smaller mounds of similar size adjacent to the triangular butte. The two larger mounds from the ground perspective. The two smaller mounds from the ground perspective. Notice the mound in the foreground reveals an area that was dug out of the mound by the locals who thought this was a pyramid complex site. I thought to myself at the time it almost looked like a pyramid complex site, yet even then I knew there was something more than a little odd about the site just from observation. 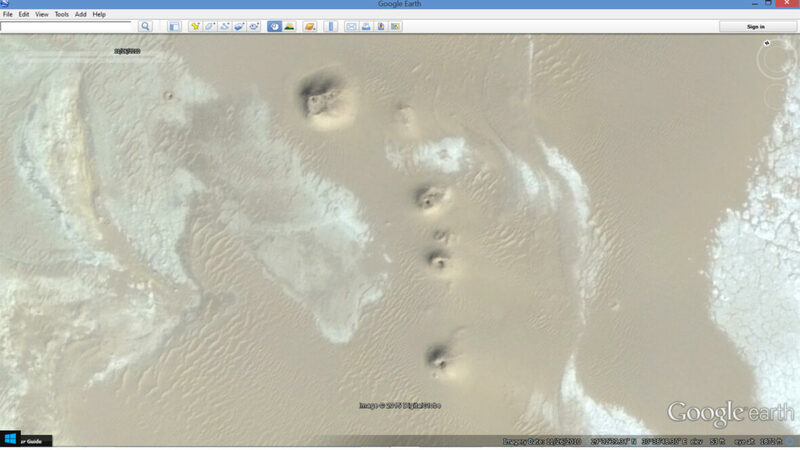 The mounds appeared natural, but they looked like they were placed purposefully in an arrangement. I made a place-mark of the site and I decided to re-visit at another time as my mind was constantly on my mother and her fight with cancer. Meanwhile the site stayed in my mind as I begin to go over all the natural sites I had seen in the Egyptian desert that could be similar. I was making my way from North to South and I had already viewed most of the Sea of Sand Desert, the Western Desert and the Libyan Desert. 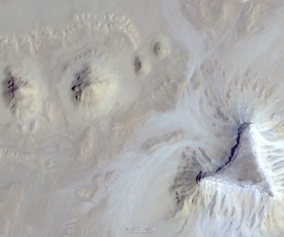 I had also traveled to the interesting volcanic mounds of the Black Desert in my Google Earth voyages as I fervently searched for archaeological sites that had been overlooked or concealed. 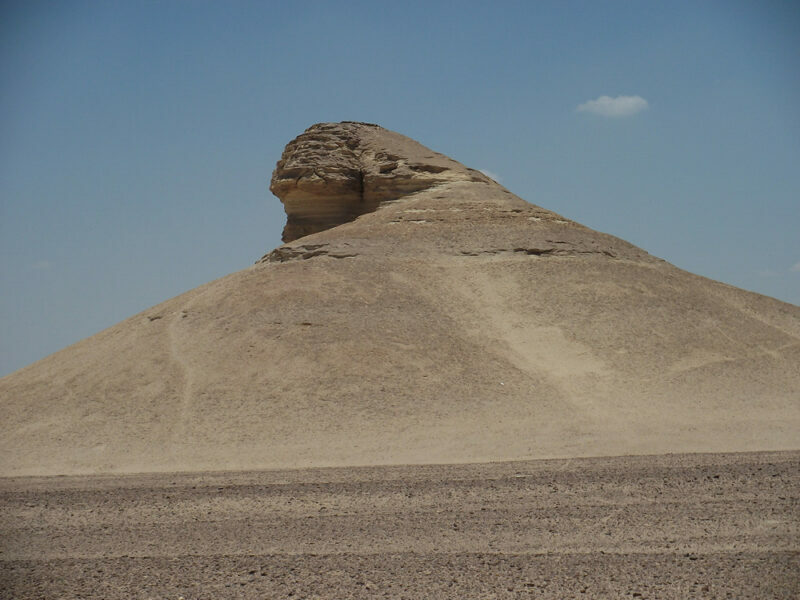 After revisiting some of the interesting geological formations in Egypt I realized that the Abu Sidhum site as I began to call it may very well be a pyramid/mound site due to the configuration of the layout. I also became familiar with limestone outcrops in Egypt and researched how many of the pyramids were built around such natural formations that were used as infill within the central pyramidal structures. Building blocks were then added around the outside to give a pyramidal form and shape. During all this time after performing tedious due diligence I did not find any site that looked even remotely similar to the site at Abu Sidhum. That was when I knew I was possibly onto something that was very unique. 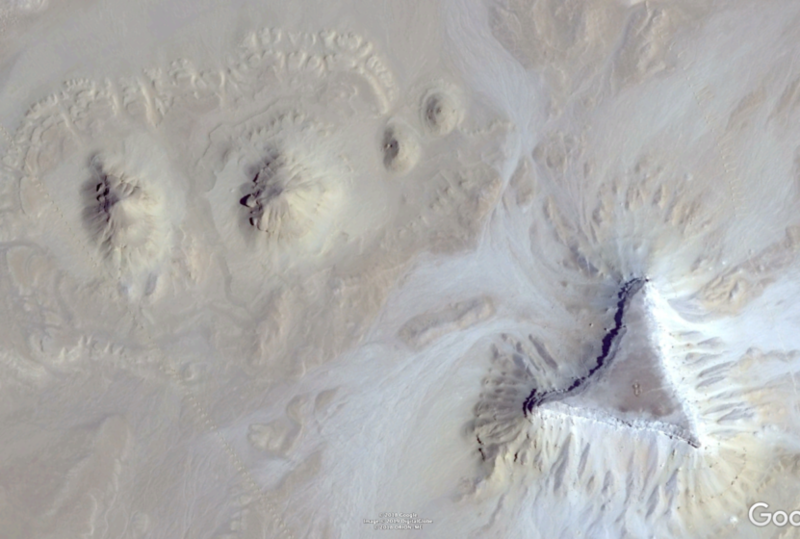 False color image of the mounds revealing possible structures in the foreground. In 2009 I gave up the search and my dreams after my mother passed from cancer and I fell into a deep depression. It wasn’t until after I visited Egypt in 2011 that I realized my mother would not want me to give up my passion so easily and I began re-visiting the Abu Sidhum site frequently with Google Earth looking around for clues that the formations may not be natural. 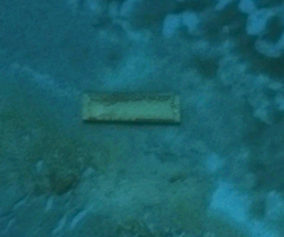 I found many features close-by suggesting there were structures buried in close proximity to this site. I found several areas to the North of the site that may contain lost ruins. These signs or “tells” can easily be spotted at known Egyptian pyramid sites. A big clue is there were many signs like this around the mounds that indicate other lost ruins may be located in the vicinity, which gave even more credibility to this site being a lost pyramid complex. I did reach out for help during this time from archaeologists and Egyptologists only to be ignored or disregarded simply because I did not have a degree in archaeology, or I was not considered an expert in this field. They did not realize how many hours I had spent searching satellite imagery over the years even before searching for ruins from space became noticed by the media. I was at a point that I gave up on trying to contact the academics and decided I would write a press release about the sites in hopes that someone would reach out to help me find out the truth. It took me months to write the press release as I wanted to word it carefully and not make presumptions without solid evidence as I knew I would be judged on every word. I used the word “possible” and stated explicitly that I needed help in identifying the sites and getting boots on the ground to see if the sites could be artificial. After sending out the press release within a matter of about 3 days the story went viral and I was suddenly bombarded by inquiries on Facebook. I was told by several friends that my story even made CNN which surprised me considering I was just asking for help in identifying the sites. What was even more shocking to me was several of the news sites were stating that I had found new pyramids and failed to mention I needed help to determine if they were indeed archaeological sites. People began contacting me congratulating me on my discoveries! Apparently, my attempts at getting help were somehow lost in translation by the media in other countries and I realized how easily stories can be distorted and twisted to the point of fabrication. I was heartbroken as I saw the ugly responses of geologists, “space archaeologists” and academics as they berated me for being everything from a “pyramidiot” to an uneducated nut job and they wrote the sites off as being natural yardangs and buttes. The “space archaeologist” had even stated in a documentary for the National Geographic Channel, that over 90% of ancient Egypt was still hidden beneath the sand yet she refused to acknowledge that an amateur could have made a discovery simply because I am not considered an expert. The response produced absolutely the opposite of what I intended for the press release to accomplish! If I thought I was alone with my research before, now I felt practically ostracized from the academics just because I had received publicity. After a few months I got over the feelings of frustration as I began to realize the academics probably were never going to help to begin with. I realized my futuristic ideals that had lead me to break new ground in science long before others were even looking at satellite imagery would probably be left for younger generations to verify after all. One thing that did humble me was the outcry from the general public. The general public was firing back at the academics for their lack of candor in their comments and even suggested many of them were just plain jealous they had never had a story go viral before! 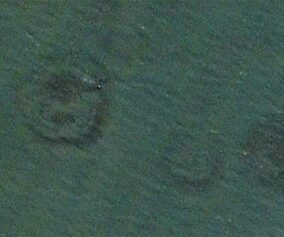 I also saw hope and realized I had inspired many people to search and research with Google Earth. There has been some renewed hope while I waited for a way to seek confirmation, I was contacted by a couple Mr. Medhat El Kady and his wife Haidy Farouk who told me they not only knew the site near Abu Sidhum was a pyramid site, they had proof in the form of ancient maps and documents. 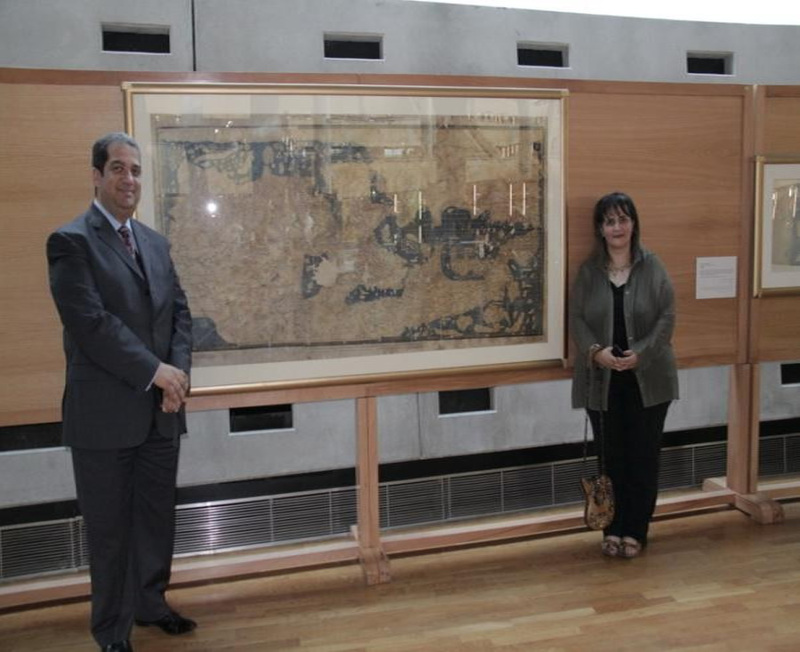 The couple had been collecting maps for a long time and Haidy was an Egyptian attorney who had helped the Egyptian government with some border issues between Israel and Egypt. Medhat was the former Egyptian ambassador to the Congo who still had a government position and their stories and information seemed legitimate. After deciding to visit them in Egypt to see the maps and documents in their collection, I had great hope their information would lead to confirmation about the site. Unfortunately, at the time the revolution had made certain parts of Egypt more difficult to travel in, and part of their collection was in a vault that could not be accessible on our trip. I took photos of one map I was presented with and listened to their story of the site. I was even told they had presented the sites in question in a formal presentation to the Egyptian Parliament to get the sites secured and to seek archaeological inquiry. To my knowledge, their presentation seemed to have no effect and produced no solid inquiry from the government. During our meeting I was asked to sign a paper to keep the information that I had received from them between us for now as the story turned out to be a bit controversial and they felt it was not the right time for it to be released publicly. See my 2019 updated article for more information. Their information suggested there may be some measure of truth to the stories Herodotus told in his Histories of the Fayoum region. He wrote about 2 pyramids that were placed in the center of a man-made lake that received water from the Nile through a series of canals. The lake Herodotus wrote about is Lake Moeris or the Fayoum lake, yet no sign of the lost pyramids have ever been found. 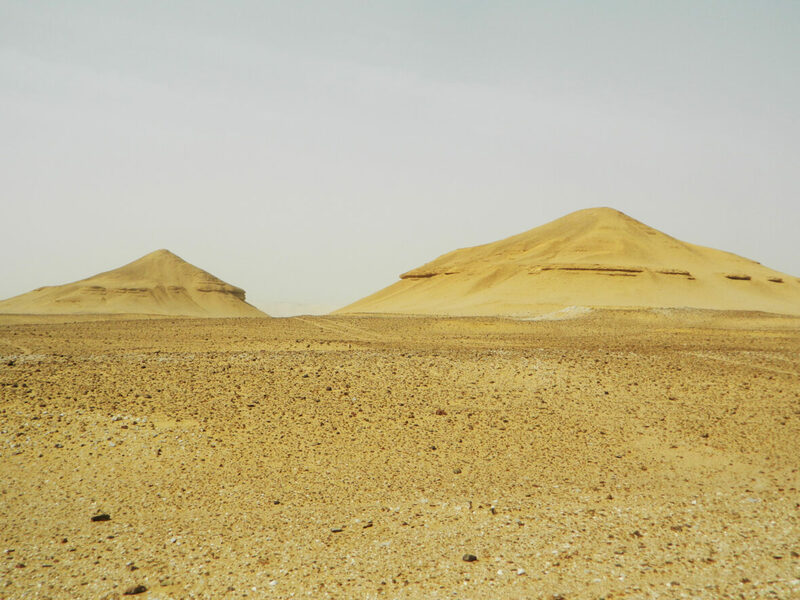 There is a possibility the mounds that were identified close to the ancient city of Dimai could give clues to the location of the lost pyramids of Herodotus. Dimai site I wrote about in my initial press release. Haidy and Medhat believe the pyramids Herodotus wrote about my be buried close to this area. After returning home a few months later I was contacted by Mohamed Aly Soliman who had a group that was going to the Abu Sidhum site and he asked if I would be interested in photos and videos. 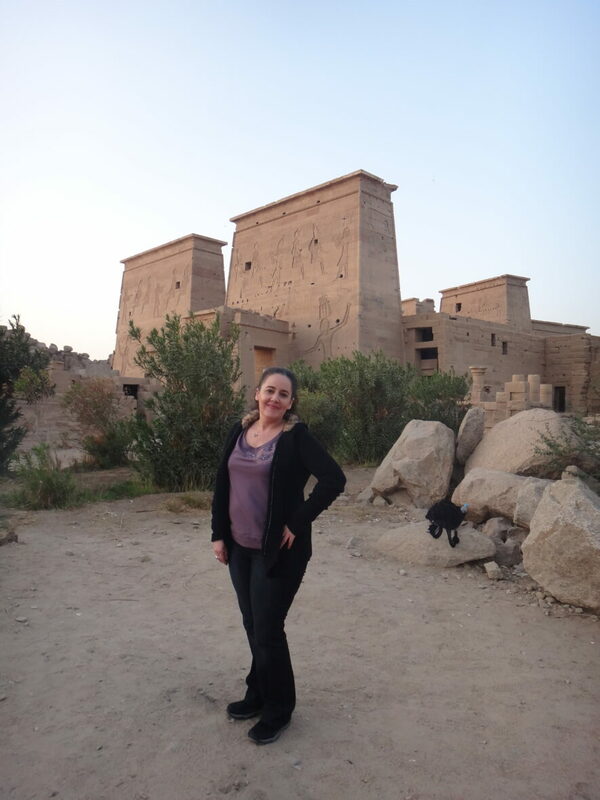 I was astounded because at this point in time I had felt the story and the truth of the site would be years from seeing the light of day, yet I had heard once Egypt calls you, it won’t let you go until you have answered and fulfilled the call. As many people who have visited Egypt can attest to, it is a place of magic and the energy of the ancient past is still buzzing and whispering in the winds to all who will listen. The power of this ancient culture that left such monumental architecture can still be felt when visiting the sacred sites and most Egyptians are quite proud of their Pharaonic heritage. After Mohamed returned from his trip he was very excited and we texted back and forth as he relayed everything he had found. He and his team were using a metal detector that was very accurate and he made me an impressive demonstration video to show how it reliably detected subsurface metal and cavities. I was very excited when he told me they had found positive hits on the 2 larger mounds that metal was contained within them. I was even more impressed that he and his team were very convinced the site was in fact a pyramid complex site, and they believed the site had been concealed intentionally to hide who or what was buried there. He relayed stories to me that the local landowners had felt the site was very strange and full of great magic as every time they visited the site, a wind storm seemed to appear out of nowhere. True to the local legends the day of his visit the wind started blowing and a sand storm appeared on a virtually clear day. Apparently, some of the locals were so convinced there is a tomb or objects buried there they started a dig many years ago on one of the smaller mounds to see if there was a chamber below. They stopped digging as their tools were not strong enough to continue breaking through the rock after a depth of about 10 feet. Hole the locals had dug into the smaller mound as they believed the mound was an ancient site. I was given no explanation as to why the locals thought the site was artificial, but I was told a very peculiar story about a hill like feature nearby. According to the locals an archaeologist from the Cairo University, launched a dig on this seemingly natural hill area and enlisted their aid in helping with the dig many years back. From satellite view this site is not very far from Abu Sidhum and the archaeologist must have been convinced this hill area was something more as he went to the effort to start a formal dig. According to the story he found some items that were extremely controversial to the point that the artifacts were either destroyed or taken away to be concealed within the dark dungeons of forbidden archaeology. I was told the relics that were found may have been of Hebrew origin and may have conflicted with the Dynastic history. 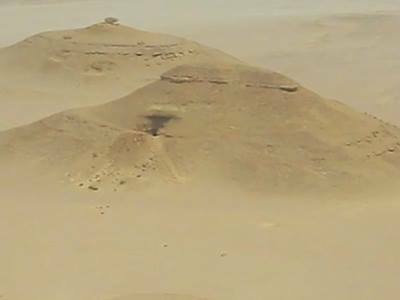 I was fascinated by this story although it is only hearsay and I began to wonder who or what could be contained within the Abu Sidhum site if it is a true, pyramid site. Mohamed also found many pottery shards that were located near the smaller mounds and some of them were dated to the old kingdom period in Egyptian history. 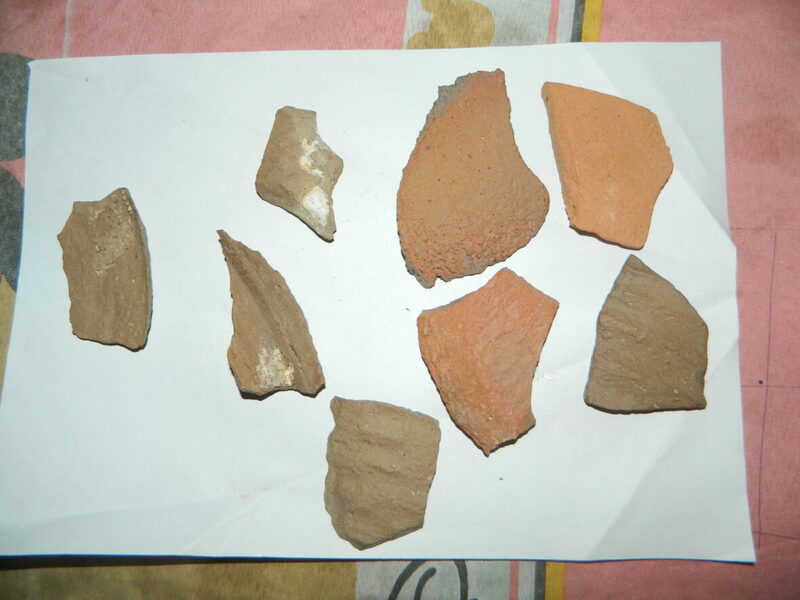 Pictures of pottery shards Mohamed found around the Abu Sidhum site. A follow up article with the new information was released online at the Discovery News website in 2013. From a logical perspective, it’s unclear why the Egyptian authorities haven’t investigated the site. (More in my update.) Even Haidy and Medhat’s presentation to the Egyptian parliament seems to have been ignored. With the new government in place, unfortunately archaeological discovery is not at the forefront of the political agenda. After compiling research I have arrived at 3 logical conclusions as to why the site may have been hidden or lost from the archaeological record. One, it is a completely natural site, end of story. Two, the site was the center of ancient controversy and was purposefully obscured from the Dynastic records to conceal the significance of who or what could be contained there. Could the Egyptian government know what is there but they have choose to keep the site out of the public eye for controversially reasons? Third reason that seems logically valid is the site could be an Archaic site that existed before the Dynastic timeline was recorded. I find the third conclusion the most compelling as I have very strong reasons to believe that many of the limestone outcrops the pyramids were built on may have been ancient structures that were just reconstituted or reclamated to become part of the Egyptian civilization as we know it. Mohamed and I have investigated another site in Egypt that I saw on a rare map of Napoleon’s expedition that Haidy showed me on my trip to Egypt. 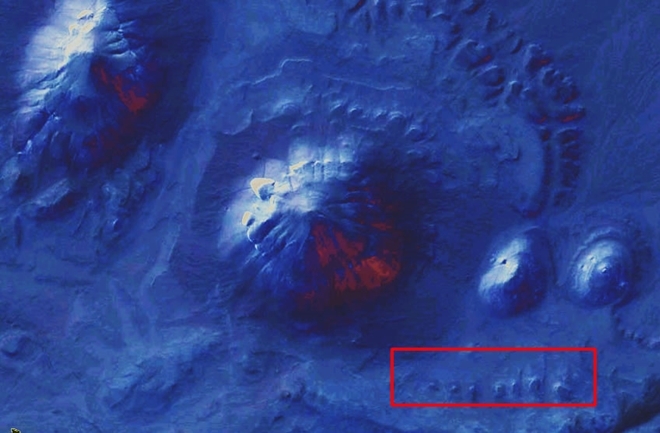 This particular site was marked as a pyramid and I was surprised as I had also place marked it years earlier with Google Earth as another possible lost pyramid site. Mohamed visited this “Napoleon site” at my request and took videos and photos that are available on my Facebook group page. We noticed the exterior of this mound area appears to be very eroded to the same degree as the weathering on the body of the Sphinx. By all appearances this mound looks natural yet when he entered through the opening it became obvious the whole mound was man made due to the stonework that is visible inside the interior and a man made vertical shaft that was leading down into the mound. 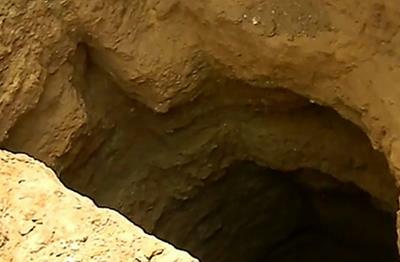 Whatever methods that were employed to create this site may have been the same methods used to create Abu Sidhum as erosion was very evident there as well. Signs of weathering like this can be produced by a combination of water and wind erosion that can melt and deform limestone rock over time in such a way that it becomes completely natural looking on the exterior. “Napolean” site from a distance. For video footage of the site, follow this link. The entrance into the “Napoleon” mound. The weathering suggests this site is very old. 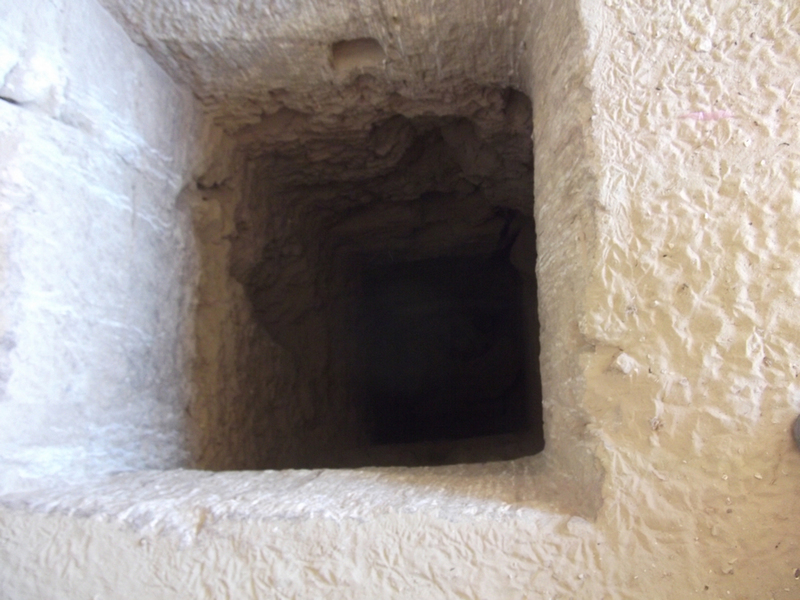 The shaft inside the “Napoleon” mound we think could be another lost pyramid site. In 2013 I formed the Satellite Archaeology Foundation, Inc., a non-profit organization to help aid in my research. What is needed now is further inquiry into the mounds at Abu Sidhum to find out if they are indeed artificial. If this site is proven to be artificial, this may open up a completely new way of thinking about archaeology and features hidden in plain site within the landscape. I have hope that within my lifetime I will get to the truth and not only expose this site but continue my research into many other sites I have identified all over the world as possible lost, hidden archaeology. I am leaving the breadcrumbs for future generations to follow. I hope that my research will help lead to new ways of seeing and understanding the past by looking at the larger picture unhindered by the limitations of dogma. By stepping outside the microscopic view of the world and looking at the bigger, macroscopic picture, I believe we can arrive at an even greater understanding of our existence and expand our understanding of the universe.